The cab driver was screaming "aap pakarke baitho ... mai jaldi se bhagata hoon" (hold tightly .. I am going to drive fast). At the back seat of that "eco", I was trying to guess the situation, as I was completely unaware what is happening there on the road. Then something hit the vehicle. Our car stopped and I could see the pale face of the driver. Then again after that momentary pause, our car starts running but in opposite direction. In front of my eyes I could see the mountain falling. Hardly 10 kilometers away from Sevoke we were trying to escape those rocks, few big, few not so big, with the help of back gear. I wish if it was a nightmare! But it was not! It all started a couple of days back when we took the train to NJP (HWH to NJP Satabdi). A pure family trip and the plan was to relax. We had our hotel, Uttaran, pre-booked in Siliguri via one of my friends. The location was good, near Bidhan market with basic facilities available. Our requirement was for a one night shelter and that hotel fits there perfectly. A clean bed, clean toilet and SONY SIX running in a portable TV (difficult to catch the scoreline from bed though!) - we were happy with that. We started the day in search of a cab. We went to the taxi stand near Bidhan Market and without much effort we had found a Sumo in good condition. From Siliguri to Darjeeling the rate is 1400 Rs. It took us a while to get ready and by 8:30 AM in morning we were out for our destination. It was a cloudy morning but not really threatening to spoil our trip. The comparatively new road towards Karsiyang is beautiful and in good condition. We halted once to have our breakfast. Once we reached Karsiyang, it started raining and the road condition also was not that good. To our surprise, the two toddlers inside our car were completely unaffected by the change in condition. I had noticed, during the journey most of the time they slept. 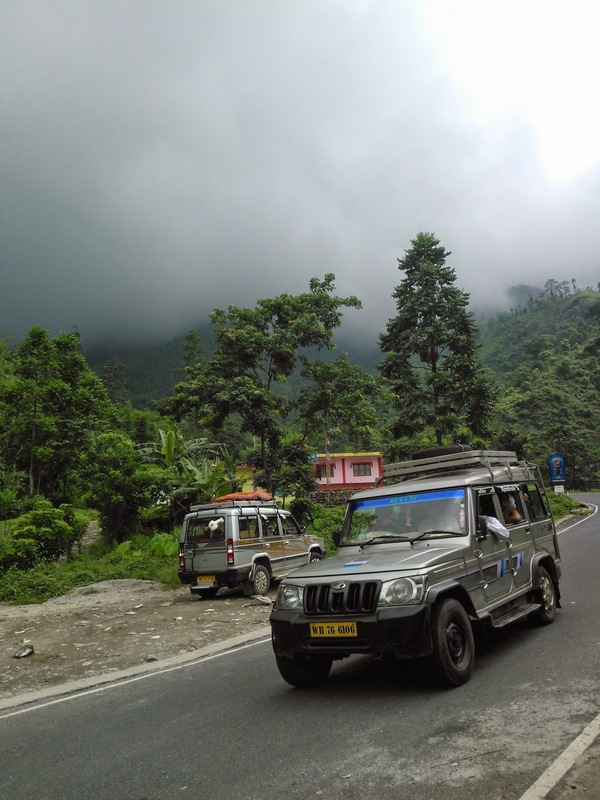 It took us around two and half hours to reach Darjeeling and by that time there was no sign of rain. We went without a pre-booked accommodation. So, once we get out of the car, my first concern was to get a shelter before the weather god changes his mind. Dodging few local agents we went to the most tranquil part of "The Mall" in search of a hotel. After checking the tariffs and rooms of a few we decided for "Hotel Dreamland". Later we realized that was a good decision. Rooms are not really big, but well maintained and clean. Running hot water available. They have some really good staffs. The manager was an aged Bengali person. He doesn't prefer to talk much but only answers to queries. The process of finding that hotel actually took around one hour and by the time we checked in, we were really hungry. Without wasting much time, we ordered our lunch. It was a simple menu - rice, dal with chicken curry. The dining space was not very big and it can accommodate hardly a dozen at a time. Food quality was good enough. Supportive hotel stuffs helped us a lot by taking care of the very demanding toddler in our team during lunch. We had our lunch in peace while they were playing with that 1.5 year old baby boy. 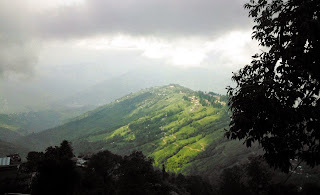 Monsoon adds beauty to hills.